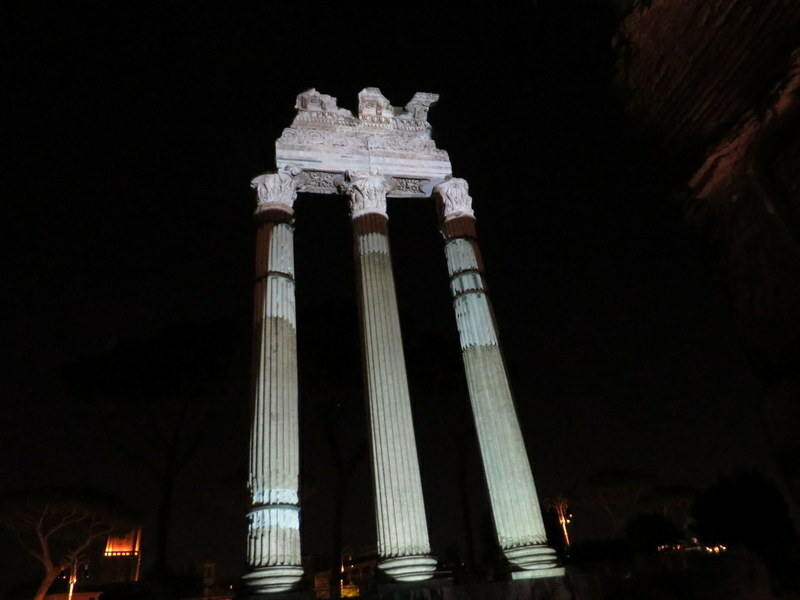 I was going to write about our new home — and I will do that soon — but I have to write to tell potential travelers to Roma in the next few months about the special evening tours of Caesar’s Forum and the Forum of Augustus. Dramatic lighting reveals important relics and helps one to understand the site. 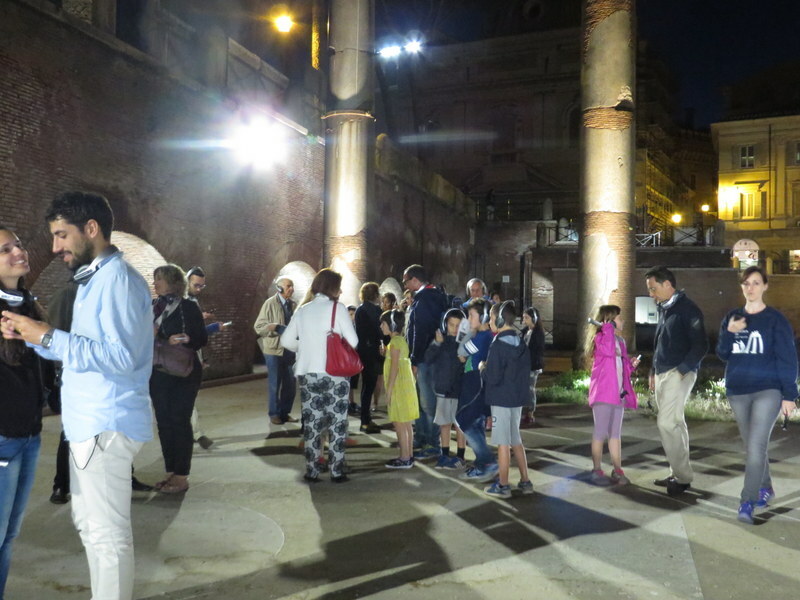 Last night Ric, Derek and I went on the audio-guided walking tour of Caesar’s Forum and we were impressed. This is the first time visitors have been allowed. It is carefully managed to avoid damage (one is kept on a walkway) but you are right there, in the Forum built over 2000 years ago. Modern Roma seems far away. The multi-media presentation, available in 8 languages, was extremely well done and helped one to understand the layout and function of the forum. It’s wonderful to have an evening activity like this, making use of the lovely evening hours after the heat of day has passed. The shows/tours run every 20 minutes starting at 21:00 and until midnight. Each tour is about 45 minutes in duration. Last year Ric and I attended the show in Augustus’ Forum, which was developed to honor the 2000th anniversary of his death. This is a stationary show, where you sit in bleachers as the multi-media presentation plays out across the ruins in front of you. Again, available in many languages, this show last about 40 minutes and is run three times each evening: 21:00, 22:00 and 23:00. You can buy a combined ticket and see both on the same night. Herewith a few pictures to tempt you. If you are in Roma between now and November 1, make reservations and go! 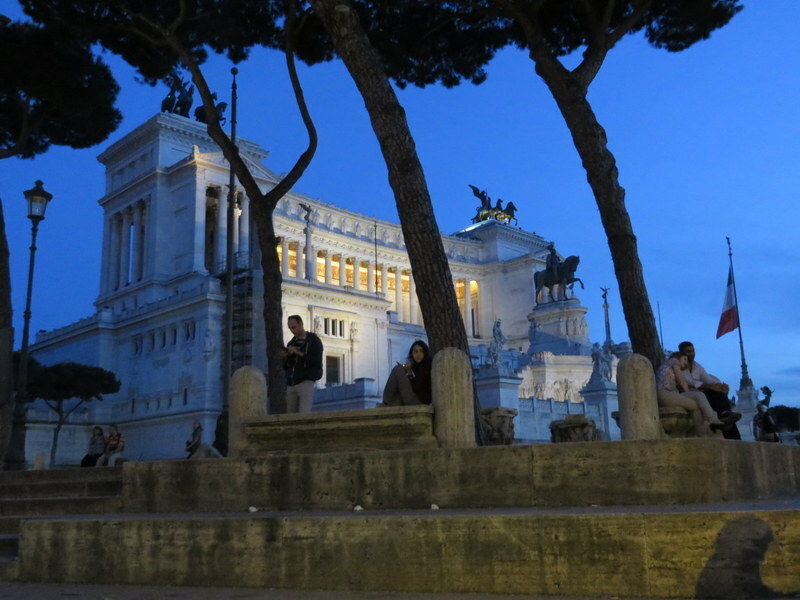 Piazza Venezia in the soft evening light, while we wait to be admitted to the site. 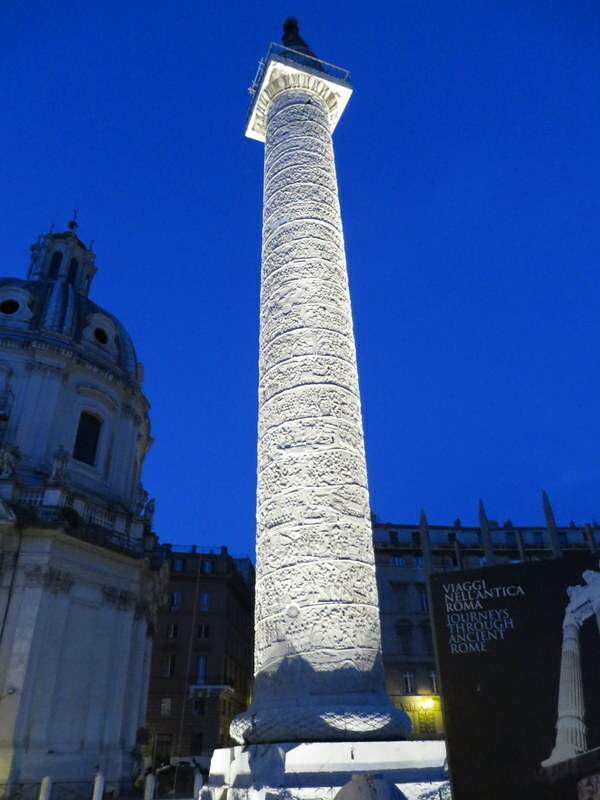 Trajan’s Column: The entry point is right under the column, very easy to find. The crowd gathers and adjusts their headsets. The guide merely ushers you through the site. We are below Via Fori Imperiali. Notice the people bathed in golden light on the street above. We are at the level of ancient Rome. 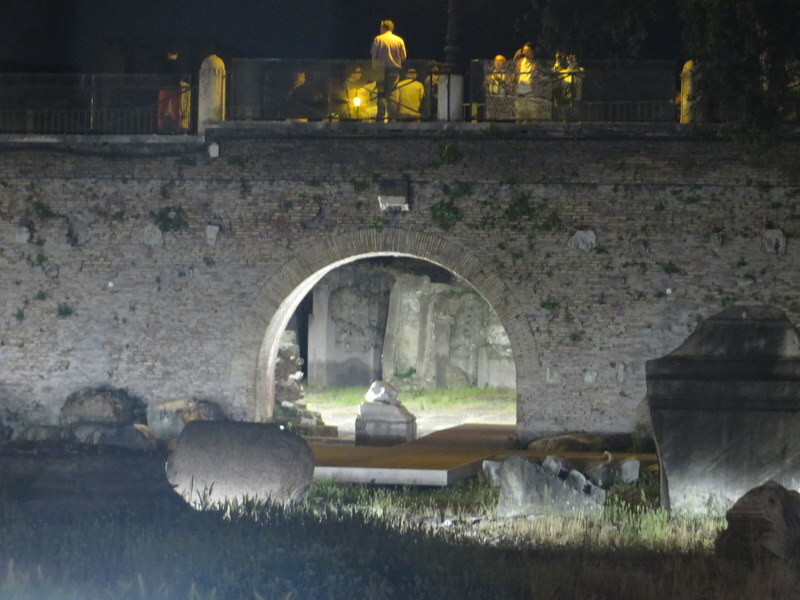 We enter from a part of Trajan’s Forum, crossing under Via Fori Imperiali into a part of the complex one usually can only view from above. 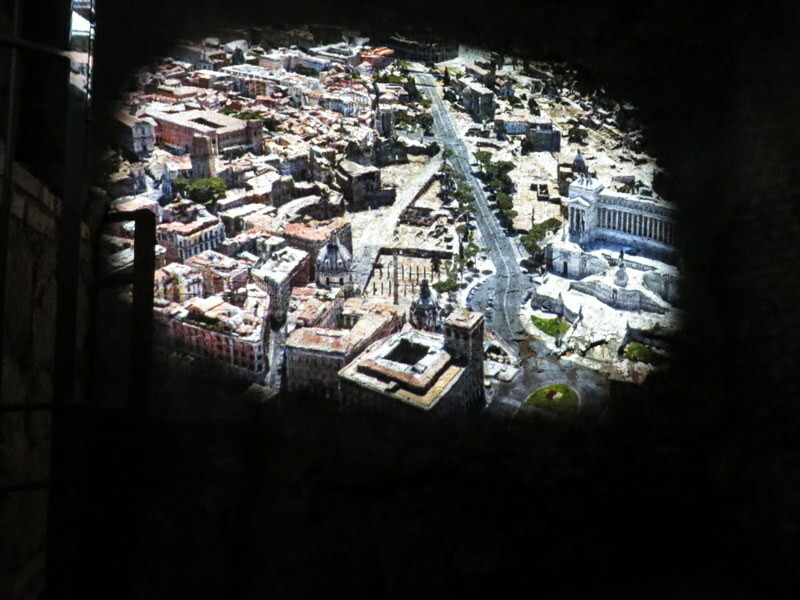 A movie is projected on the ruins showing the creation of Via Fori Imperiali. That photo of piazza Venezia was spectacular! Ciao Marcia, thanks! I was surprised how well that turned out in low light. Lovely photos. 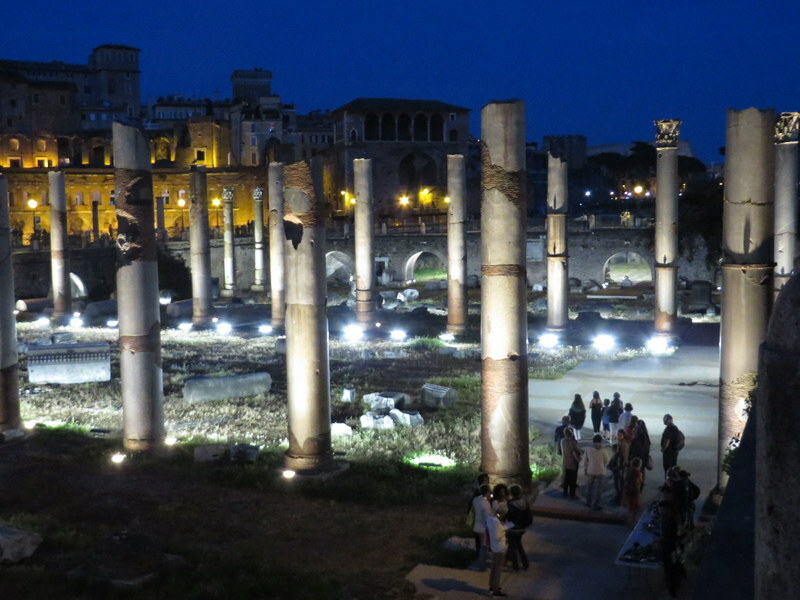 i would love to see the forum by night. i do remember when one could roam the entire forum unimpeded by fences and paths. That too was nice. In which area is your new home located? Hi Chloe. We are still in Parioli. Did not want to have to learn a new neighborhood, too!